Not currently in service - but check out the Chat room. Just in case you might have missed anything throughout the season, important notes that appear on the home page or other messages will be posted here as well. Other places for information include the rules and frequently asked questions. There is a 1-week delay between when you sign a player and when he is available for your lineup - so, in order to have your Opening Day roster ready for Week 1, you must have a legal roster by the end of signings on Week Zero. That gives you five weeks of transactions. All teams received an extra 1000 in cash to help cover prospect roster costs (there's a fee of 250 to put a player there). However, you are not required to use the cash for prospects - for teams short on cash and not yet with a legal roster, you can use it for regular transactions as well. The next cash distribution is for 2000 during Week Zero. We're a little bit more than a month out from Opening Day, so it's time to think about payment for your 2019 teams. For returning owners, your deadline to pay isn't until Opening Day. If you are playing a lot of teams, you might want to check out one of the two package plans. Transaction Order is now reset for the Redistribution Draft and off-season free agency. League champions draft last, runners-up are 15th, and the remaining division winners draft 13th and 14th. Results of carryover choices posted. View the Transactions page to see the cuts in your league. The 2019 Redistribution Draft is now open. You'll have just about 3 full weeks to make your selections (see the link on your team roster). Deadline is Sunday night 2/3/19 Midnight EST. Then, after Feb 3, we post the results of only Round 1 only - any drafted players will be removed from the remainder of your lists. With all the cuts - the Trade Rumors list is cleared out in our annual deletion of everything. Any players on your Prospect Roster have been moved back to your 40-man roster. You can begin to move players to prospect status again after the Redistribution Draft. For orphan teams assigned between 12/31 and 1/12, your orphan cash has just been distributed in a special financial update so that you can judge your team's finances accordingly. (Foster parents not included - that cash is distributed when a permanent owner is assigned). All orphan teams currently have foster owners - thanks for the volunteers! Luis Valbuena, who died in a car crash last month, was removed from the BWB player list and automatically removed from the rosters of 10 BWB teams. Final offseason culling of the player list - 131 players removed from the game, including just 1 who was on a BWB roster - Henderson Alvarez (who was automatically removed from any BWB rosters). Position for all players for 2019 are now finalized (after checking all the minor league players). Next step is to add the new players into the game based on MLB 40-man rosters - shooting to get them posted by Sunday night. Among the page/site fixes mentioned yesterday....on the multiteam tools page there is a link for you to check all of your teams for errors on your carryover selections. That page is now modified to handle Prospects correctly (let me know if you find any errors). Trades are now closed until after the Redistribution Draft is completed in February. 125 players were removed from the game on the basis of retirement or signing to play in foreign ball, including these 8 that were on BWB rosters: Chris Anderson, Cody Ege, Jose Fernandez, Jeff Ferrell, Casey Kelly, John Lackey, Jefry Marte, and Jake Thompson. Those players have been automatically deleted from any BWB rosters. Happy Holidays! I'm back from a few days out of town and can start ramping up with more action on preparation for next season (page fixes, rule change conversation, new features?). I'll have some time to do a little work on Thursday night - no time on Friday - and then will get into it more over the weekend. I've got the last batch of orphan teams to add to the list Thursday night from owners who never responded yes/no. Seven more teams to add, including 2 teams in Moneyball and 1 team in Murderers' Row if you're interested in a private prize league. OK - I think I've got this right - the information below your roster about your roster limits and the totals of the players you are keeping for 2019 should now handle the prospects on your team correctly. Let me know if you find any errors in the counting or on the page itself. Prospects don't count against the 28-player maximum that you may retain on your roster for 2019. So you can keep up to 28 players AND some or all of your prospects. You may cut some or all of your prospects, you're not mandated to keep them. After the roster carryover decisions (January 13), all prospects will revert to be part of your standard 40-man roster. Keeping prospects will reduce the total number of players you can pick up in the Redistribution Draft. After the Redistribution Draft is compete, you can then make moves to put players onto the prospects roster for 2019. A reminder that your picks for which players you'll keep on your roster in 2019 are due on January 13, but you can be working on that now. 13 players were removed from the game on the basis of retirement or signing to play in foreign ball, including these 6 that were on BWB rosters: Jabrari Blash, Chris Gimenez, Justin Haley, Justin Hancock, Pierce Johnson, and Tommy Joseph. Those players have been automatically deleted from any BWB rosters. First wave of orphan teams are listed. Contact me if you're interested - you may want to list an alternate or two in case your first choice is taken. Reminder that the deadline to say if you're keeping each of your teams in 2019 is December 9. We assume the unanswered teams become Orphans. Payment for 2019 teams is available. For returning owners, your deadline to pay isn't until Opening Day - though if you pay by December 9, you'll get a $5 discount per team. If you are playing a lot of teams, you might want to check out one of the two package plans. If you've signed up for new teams or have bonus teams you want to use, there are new leagues for 2019 now available to join. MLB Info has been updated to reflect transactions between 11/6 and 11/24. 13 players were removed from the game on the basis of retirement or signing to play in foreign ball, including these 6 that were on BWB rosters: Raul Alcantra, Adrian Beltre, Alan Busenitz, Joe Mauer, Chase Utley, and Christian Villanueva. Those players have been automatically deleted from any BWB rosters. Earlier in November, these players were removed from BWB rosters for the same reasons (including some unsigned 1st round draft picks): J.T. Ginn, Mike Marjama, Brandon McCarthy, Victor Martinez, Stewart Carter, and Brad Ziegler. Quick and dirty fix - your post season roster page and the page you use to select your cuts are both now updated to show which of the players on your roster are "prospects" - those players do not count against the 28 maximum players you can keep for 2019. Later - hopefully by the end of the coming week - the roster page will correctly note the totals at the bottom to reflect which players you're keeping and that prospects don't count in the totals. I'll be updating the post season roster page and will add in a link to let you change your lineup (to help arrange who you're keeping or not) - in the meantime, you can get to the lineup change form from the all your rosters page. After the Redistribution Draft is compete, you can then make moves to the prospects roster for 2019. Sunday night 11/25 - Player MLB status will be updated for MLB transactions after 11/6 - any players that have announced retirement since 11/6 will be removed from the game. Sometime in December after the Rule 5 draft - new players will be added to the BWB player list if they are on the MLB 40-man roster. Hey - quick note to answer some questions from a few people... If you're trying to use your bonus teams to join a new league, or if you just signed up for BWB and want to join a league - the new 2019 leagues aren't active yet. And we don't have any orphans ready yet, either. I will try to have some of that ready this weekend but we have family visiting, so it might be later on Sunday or on Monday before they are ready. On the page where you answer if you're keeping your team(s), the 5 new leagues in 2018 were not listed. Those are now available. With the fixes to player salaries, the salary cap value has changed slightly. Instead of 38490, it is 38954. The difference has been added to your team finances and your cash balance is updated. There's no change for new leagues in 2019. Salary calculations have been fixed and the salaries on the site are now corrected. Again - these do not yet include the premium salary adjustments. With the salary corrections, I need to double-check the cap value for 2019. I plan to have that verified/corrected by Tuesday night. Trades are now open - the first fall trade period deadline is Sunday, Dec. 9 at midnight Eastern. First step before you can do any trading or pick your carryover players - indicate if you're keeping each of your teams in 2019. You must answer "yes" before you may submit any trades or before anyone can contact you for trades. Deadline is December 9 or we assume the unanswered teams become Orphans. There's another issue with salaries - for at least several players didn't play in MLB, their 2019 salary is showing as the same as 2018...and that's not right. I will redo the whole salary calculation to make sure it's right. This may affect the salary cap (but unlikely to have much effect). OK - I'm very sorry for the delays - but you can now see some of the results of the setup for 2019. Players now have new (incomplete) salaries for 2019 and their positions are set for 2019. Usually I post some things in late October/early November and that allows me some staggered updates, but since I didn't get the salaries/positions done earlier, I was stuck a bit in having to change too many things all at one time. Salary cap cash has been distributed. The 2019 salary cap is 38490 (was 42034 in 2018). Free bonus teams have been distributed. 2019 Salaries are not yet final - I still need to go through and add in the premium salary adjustments for top MLB performers that will increase some salaries 1-30%. My plan is to have all the salaries final by Sunday night, Nov 25. Any player showing an "x" in their position didn't have any MLB stats in 2018, so I need to go back in and check what they did in the minors in 2018 (or maybe they didn't play at all) - those positions may change. That usually takes a lot of time and will be finished sometime in December. Soon I'll open up a page to allow you to indicate which teams you're keeping in 2019. By Monday night, I plan to open up your options to begin trading with other teams. As soon as possible, I will open up the page to allow you to indicate which players you want to keep for 2019 and which ones you'll release into the Redistribution Draft. New leagues for 2019 will be opened soon. As people indicate they're dropping teams, orphans will become available. The Natty Lights are the defending Bash champion and Jesse has won the Bash 4 times before with 4 different franchises. Jason is going for his first Bash title. Final Result: Fiorello's swept The 4-0; Congratulations Jason! 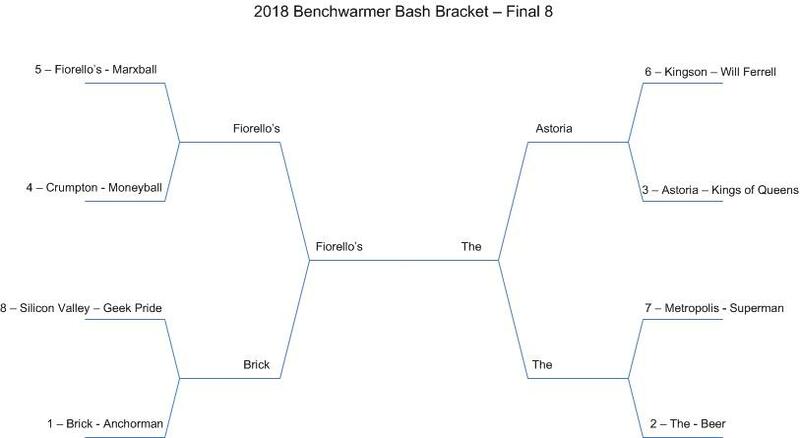 Winner The Natty Lights (Beer League) just won the Beer League championship and heads into the Bash as the Bench Federation top seed. Runner up Crumpton Roches (Moneyball) also was a league champ this season and is the #1 seed in the Eckersley Federation. Don't forget - if you're still in it and you want to change your lineup for the 2nd week of the playoffs, the deadline is tonight at 11:59 PM Eastern. You can reset your pitching rotation from scratch - you don't have to consider "games of rest" between the 1st and 2nd weeks of the playoffs. 58 of the division winners from last season finished below .500 in 2018. From the 216 divisions that existed in 2017, 48 division winners in 2018 are franchises that never before won a division title. Of the 54 league champions from 2017, 32 of them repeated as division winners this season. (25 of 49 league winners from 2016 won divisions in 2017). 32 teams went "worst to first" - finishing in 4th place in 2017 and winning a division this year. Playoff schedules updated to show probable starting pitchers. This season, there were 14 divisional ties. In 2017, 7 divisions ended in ties - how did those teams in last year's tiebreaker games fare this season? Still working on some setup tasks and some MLB game stat updates/corrections - I don't expect we'll have any playoff game scores posted tonight - but should be all set for Thursday. Playoff schedules are posted. You can see the your league's playoff brackets from your league's home page - or you can check out the Playoffs for All Leagues page. You can reset your rotation now between the first and second playoff week without worrying about how many games of rest your starters have from the first playoff week into the second - you start the next series fresh. All the playoff tiebreakers are resolved and listed for home field advantage and playoff seeding. The playoff schedule will probably be posted by Wednesday evening - and we might get our first playoff results then. Currently working through the ties to determine playoff seeding. All the division tiebreakers are resolved and listed. Next step is to look through any ties in the seeding of the Gore Cup and Bottom Feeder Open brackets. Week 25 Statistics and Players of the Week - the Player of the Year results are not yet final. Brinkley has won the division 6 times, including last year and was league champ in 2012; Liverpool has never won the division, finishing 2nd 5 times including missing by 1 game to Brinkley in 2017, 2012 and 2011. The teams split their season matchups 9-9. Walking Dead gets home field with the better division record. Interlaken has won the last 3 division titles (4 overall) and was league champ in 2016. Gashouse was the league winner in 2007 - the only time it made the playoffs. Hollywood was league champion in its only playoff appearance (2012), while Bizarro has 3 previous division wins, including last year, and won the league in 2014. Bizarro won the final 2 games of the season against Hollywood to force the tie. Over the last 2 weeks, Bizarro won 4 of 6 between the team. Ames is the defending division champ and also won in 2012. Cincinnati has never made the playoffs and its best previous finish was 3rd in 3 different seasons. Oh...but not so fast! We have 14 divisional ties in 11 different leagues that we need to break. For those, there must be a Game 151. Look for setup for the tiebreakers on Tuesday - results will come either late Tuesday night or on Wednesday. Don't forget that any lineup changes you want to make for the first week of the playoffs are due on Saturday, Oct 6, at 1 PM Eastern. It takes a bit for me to set up the playoff brackets - I would expect game scores to start next week sometime. From earlier: Three games to play and 63 division titles are not yet decided. Here's the final update to the close division races across the BWB universe. For roster changes, you can't sign any players - you can only cut players or move players to IR in case you need to make room on your active roster for your playoff lineups. During the period of time when you are picking your 28 players (maximum) to retain for 2019, any player under contract for 2019 and beyond must be kept - at least until after the Redistribution Draft. If you've signed a player to a long term contract and you've decided you don't want him taking up one of those 28 spots, you'll need to cut him now. As always, you don't receive any salary rebate for the extended years. Schedule update - I spent a couple of days trying to automate my box score download process (currently do that by hand) to better handle the daily document dumps I'm getting from my stat provider that's causing some of the current problem. No luck on that yet, so I'll have to fix that another day. Last week my MLB stat database got a little screwed up. I have some safeguards and checks in place, but I missed the fact that I didn't have some stats loaded from 9/11. This is a result of some inconsistency in the data that I get - but also some mistakes on my part for getting corrected information loaded. For the most part, this isn't a problem - the games on 9/11 for the teams were in the 144-147 range - stuff that would show up in Week 24. However, I'm still missing some information for the Mets and Marlins - and both teams played their game #143 (translating to BWB game #138) on 9/11. As a result, their game information for 9/12 got mislabeled as game #143 and that's what ended up being used for BWB game #138. So - in the interest of getting this right, although it probably won't affect more than a few BWB outcomes, I'm going to rescore game #138. I do still need some additional time to clear up the MLB stats - yesterday my provider dropped another load of 500 box scores (a mix of the Saturday games plus corrections to their files - even small ones that don't factor into our game) and I need to still process those. At this point, we're not on any hard deadline - you've all submitted your Week 25 lineups - there are no transactions/lineups due until we're ready to start the playoffs - and that's usually in early October. Move on with scoring games after that's all done. Thanks for your patience - I wanted to make sure that this got done correctly. Some of this is caused by my rush on some tasks so I'm going to be deliberative with getting this fixed. Entering the final 16 games of the season, here's a look at the close races for division crowns throughout BWB. Reminder - The Week 24 transaction submission (our current week) is the final chance to sign players during the 2018 regular season. If you need guys for the playoffs, this is your last opportunity. Deadline is Sunday at 1 PM Eastern. A reminder of what's coming up of importance in the BWB calendar - See the season schedule for details. Week 21 is the week where we're supposed to shift from Mondays to Sundays for the weekly transaction/lineup deadline, but because of delays in getting Week 20 posted, we'll keep Week 21 on Monday and then shift to Sundays on Week 22. This is the final week that you can move players to the Prospects Roster for this season. This question comes up every year, so just a reminder - when a player is traded, any other transaction the original team has with that player is automatically deleted. So it's not possible for team A to extend a player's contract and trade that player to Team B with that contract extension. If that's something you want to do as part of a trade, you need to 1) have Team A extend the contract this week and B) execute the trade NEXT week. New feature on the lineup change page - Once you have picked a player to move to the Prospects Roster, you can now give him a lineup designation of "Prs" that will free up space on the active roster immediately. This is similar to the "Cut" and "Inj" options. Reminder that Week 21 is the final week to move players onto the Prospects Roster for the 2018 season (deadline Aug 19). You all just played three weeks of games within your division. Weeks 15-22 will all be games outside the division and we close the season in Weeks 23-25 with another round of intradivision play. Reminder - you can reorder your starting pitching rotation this week without a penalty for games between starts between Week 15 games and Week 16 games. Every 5 weeks we shift the deadlines to better match the MLB schedule (we play 6-game weeks, while MLB teams often have 7-game weeks). So for Weeks 16-20, our deadlines for lineups and transactions are now on MONDAY. As mentioned - the transaction error-checking does not yet work for the new transactions - and "moving to prospects" will not be recognized as valid. You will see a message: "There is some unspecified error (refreshing screen may help)" - that one you can ignore. And it's possible this may change in the future - but after this week when the first players will land on the prospect roster...when you trade prospects, they will be placed on the receiving team's 40-man roster - and if desired to put on the prospect roster will need to be a separate transaction the following week. The receiving team will need to make sure there is room on the 40-man to allow that trade to work. IN CASE YOU MISSED IT - First round draft picks of 2018 are now in the player list. You can sign them this week. There is a slight risk in signing draft picks - if the player does not sign by the MLB deadline (July 6 for players other than college seniors - those who have used up their college eligibilty have until 1 week before the 2019 draft to sign), the player is immediately removed from your roster and from the BWB player list. How to find the picks? On the player selection screen, use the "Other" filter and you'll find an option for "First Round (2018)"
Also now available - you can sign players directly to Injured Reserve - again, pick the free agent as you'd normally do and then on the transaction index look for the special signing designation to indicate that. Transaction warnings do not yet take these new features into consideration - those will gradually get fixed over the next few weeks, but until then you'll need to figure them out manually. I've tried to test everything possible, but if you find something that doesn't work right - whether with these new types of transactions or with things that have been around before this, please let me know. Very close to getting the prospect roster spot operational - it will be ready by this weekend. When will you see the first round draft picks hit the BWB player list? So the first week to sign them will be Week 13 - with a Tuesday, June 26 deadline. That gives you a couple weeks from now to figure out who you like. Meanwhile, as posted in the rules, the 1000 in cash distribution that was to come in Week 10 to cover costs for the prospect slots has been granted to all teams. Every 5 weeks we shift the deadlines to better match the MLB schedule (we play 6-game weeks, while MLB teams often have 7-game weeks). So for Weeks 11-15, our deadlines for lineups and transactions are now on TUESDAYS. Every 5 weeks we shift the deadlines to better match the MLB schedule (we play 6-game weeks, while MLB teams often have 7-game weeks). So for Weeks 6-10, our deadlines for lineups and transactions are now on WEDNESDAYS. Week 3 complete - That's it for the first cycle of games within your division. The next 8 weeks have you playing teams in the other divisions. Unfortunately, division position in a given week is calculated from the transaction order - and the transaction order for Week 3 had already been overwritten by Week 4, so for Week 1, I calculated that everyone was in 4th place for cash purposes (with cash award of 150). The cash awards for place and record you actually received during Week 3 transactions was subtracted from the cash you should have received. Those two values were added up and put into the "Miscellaneous" column on the 4/25 update - and any negative amounts were changed to zero. So nobody had money taken away from what they expected they would have coming into Week 4. It's possible that some teams got more cash than they should have, but that's better than having teams not get as much cash as deserved. I won't go back to Week 3 transactions and look for any teams that didn't get players because they didn't have enough cash. The next score update - for Games 2 & 3 - is expected on Tuesday night (weather permitting that games in Kansas City and Minneapolis occur tonight). An addition of a new optional roster designation that will come in mid-season - the "Prospects" roster - up to 5 minor-league players who are safe from carryover decisions in December - that won't count against the 28 maximum players you can keep. Some provisions to deal with potential collusion and tanking. Corrected season schedule and deadlines - not sure what calendar I was looking at (or not looking at), but all the dates beginning with Week 6 were wrong. Any teams with cash balances above 5000 were cut down to that level (exceptions: new leagues, new owners taking over orphan teams, and orphans adopted on or after Week -2). Players are only added at the time of the posting of transaction results - so you don't have to be searching daily for new additions. You'll find the new players in the player/free agent list - find the drop down box for "New in 2018" - players are listed by the first transaction week in which they can be signed. Due to some snafu with our stats provider, I only have complete leaguewide box scores from March 29, so players who debuted after that - like Scott Kingery - will show up for Week 2. Weekly schedule for your entire league - this is the link I'll post on the home page when we score games, it's also available on your league's home page and in the footer of every web page - the "Results" link. This page will show the results and links to box scores. Full season schedule for your league - a text representation of each 3-game series for this year. It's also available as a link on the league home page and on the weekly schedule. This page will not show game results. Full season schedule for your team - A running record of all your games (or check out another team), including YTD record at each game, a link to the box score, and a look at upcoming pitching matchups (available once I get the Week 1 lineups from everyone). This is available from a link at the top of the weekly schedule page. We're getting down to the wire for the final touches on your rosters heading into the season. Non-BWB game option: One of our owners plays in a Roto league that's been around for about 30 years, but the league just lost a long-time owner who passed away. It's high stakes - $560 buy-in (though that might get lowered). If you're interested, let me know and I can connect you. All teams have a legal roster - the Startup Draft is complete! Once the Week -2 transactions are processed on Monday, the league will be open for regular weekly transactions. The Grunge League (list draft - draft list due tonight) and the Original Six League (live draft - 4 PM Eastern on Sunday) are both full - but I have a person or two in each league who joined to fill the leagues - and would be willing to step aside if you want in. Please contact me ASAP if that's the case. There will be no more list drafts to run in 2018 - but we can take one more shot at a live draft league - the Wes Anderson League - with the draft to run on Friday night, March 23 at 9 PM Eastern. There is no guarantee the league will run - but join it if you are interested. Don't pay for that league until it's a guaranteed start. Payment is due by the Week One transaction/lineup deadline (April 5) - do we have a record of your payment? Contact me if you think we're missing something. Wes Anderson League - just as one more possible option but there is no guarantee this league will run. This would be a live draft on Friday night 3/23 at 9 PM EDT. Are you already a BWB team owner and want to add teams? Check first to see if you have an available bonus team from 2017 or else add new teams here. Grunge League - This list draft league has 10 out of 16 teams filled - it will run, but we need some additional owners! All teams have a legal roster - the Startup Draft is complete! Once the Week -3 transactions are processed on Monday, the league will be open for regular weekly transactions. Welcome to Benchwarmer Baseball - It's a unique form of fantasy baseball as we play individual head-to-head games simulated from daily MLB stats - this isn't a Rotisserie game. This is fantasy baseball 365 days a year. In early January, teams cut down their 40-man rosters to a maximum of 28 players that they can carry over onto their 2018 squads and went through the Redistribution Draft to restock the rosters from the available free agent pool. Now they're putting the finishing touches on their rosters before Opening Day. Check out the Benchwarmer Baseball Tour for an introduction. Check out our list of new leagues for 2018 that you can join to begin your dynasty. Or, if you'd like to attempt to turn around a struggling team, view our available orphan teams ...pick up an existing team and rebuild it, rather than start from scratch. Orphan teams are also just $35 - about 1/2 the normal price. If you're interested, your first step is to sign up here. Then go ahead and pick out a new league or check out the orphan list again. Are you already a BWB team owner and want to add teams? Check first to see if you have an available bonus team from 2017 or else add new teams here. Email us if you want an orphan team and we'll set you up. The new tentative date for a live draft for the Original Six League is Sunday, March 18 - the start time will be worked out soon. Broadway League - Phase One Draft - Live Today! Season schedule and deadlines updated with 2018 dates! Contract extensions for 2019 and beyond are now open/active. There is no rush to do this and likely the only reason you want to do them this early is to get your cash balance down below 5000 by Week Zero. Week -5 transactions corrected to assess the 250 fee for IR moves. Team cash balances have been updated. Prize Leagues - Did you know there are some private leagues within BWB that collect their own fees and pay out prizes? There are two orphan teams available in the Beer League and one in Moneyball Leauge - See the list and contact me for more details if interested. Live Drafting! We're continuing to try out a live draft process for new leagues and have 3 of them set aside for that purpose this year. We need to fill them to run them! It looks like the Broadway League is getting close - and we have a tentative draft day set up as Saturday, March 3. We'll narrow down an actual time once we get a couple more entries, but plan on a time in the afternoon (EST). Join now! Check out the list of new leagues, where you'll also see details about the draft process. New: This applies at the moment to teams in Birdland - but once your Phase One draft deadline passes, you can now view your draft list where before you were redirected to a "too late" page. Access the Startup Draft link on your team roster page. Next deadline is Sunday night, Feb. 18 at midnight EST - this is the final submission week and then we'll process all 3 of the remaining rounds. Slight hiccup on the Redistribution Draft pages on Sunday morning - that's now fixed but to give you some additional time if your work was interrupted, I've pushed back the deadline to Monday, January 29 at 9 PM EST. I wasn't going to be able to work on it until Monday night anyway - so this deadline gives you some additional time and I can still start on it before midnight on Monday. Reminder - Redistribution Draft Lists - at least for Round 1 - are due tomorrow night - Sunday, January 28 at midnight EST Monday, January 29 at 9 PM EST. View all of your teams' Redistribution Draft lists - including potential error messages. Don't forget - you can ignore the errors for players with round zero if you want to keep those players on your list for the next week. Forgot to do this - the transaction order for each league is now reset to be in effect for the Redistribution Draft. This mostly affects division winners from last season - the league champ drafts 16th, the other conference champ 15th, and the other 2 division champs 13th and 14th. Quick note on the Redistribution Draft lists: Technically, if your list has any leftover "round zero" picks (not ranked in Rounds 1-5), those lists will show up as having errors - and during processing all those players without a valid round would be deleted. However, some of you utilize a method where you identify a lot of players to put on your lists and then figure out who to rank...and that when we move into the 2nd and 3rd weeks of the draft, you might need to add some of those unranked players into your lists. Rather than make you do all that work over again, BWB will save any players on this list that might not be legal - when you go back to the 2nd or 3rd week, they'll still be on your list, provided that nobody drafted them already. View all of your teams' Redistribution Draft lists - including potential error messages. Deadline for the first round of picks is Sunday night, January 28, at midnight EST. White Elephant League is full - I've reset the draft list due date to Friday night, January 19, at midnight Eastern time. The 2018 Redistribution Draft is now open. You'll have just about 3 full weeks to make your selections (see the link on your team roster). Deadline is Sunday night 1/28/18 Midnight EST. Then, after Jan 28, we post the results of only Round 1 only - any drafted players will be removed from the remainder of your lists. Things to know as we continue to prep for the 2018 season.